In light of the phenomenal advancements in marketing technology, it is important to dispel some of the popular myths surrounding market segmentation and explain why needs-based segmentation is still the main route to commercial success. The most common objective of modern com­mercial organizations is the sustainable creation of shareholder value. This can be achieved only by providing shareholders with a total return, from capital growth and dividend yield, that exceeds their risk-adjusted required rate of return for this particular investment. 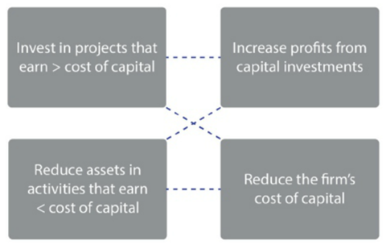 In today’s highly competitive environ­ment, the major sources of shareholder value creation are the intangible mar­keting assets of the business, such as brands, customer relationships and channels of distribution, the 70% of the company’s value that does not appear on the traditional balance sheet (see Figure 1 below). Consequently, the critical future marketing strategies of a company, which indicate how these assets are to be developed, maintained and exploited, are the role of properly trained marketing specialists, not some­ one playing around with technology. So a changed approach is necessary, which entails getting back to basics, and this represents a major opportunity for our community. It can be seen that market/customer selection is key to the whole process. The only way that SVA can be achieved is by making offers to market segments that utilize the entire organiza­tional asset base effectively and which take account of the needs of all stakeholder groups. Over 40 years of research into the link between long-run financial success and marketing strategies reveal the strategies in the table below. The first point in the table is key to understand­ing the crucial role of segmentation, because today all products are excellent, so profitable differentiation is unlikely to come from an organization’s products. It is much more likely to come from the way it relates to its markets and customers through the process of segmentation. Indeed, a Harvard Business Review article claimed that 90% of 30,000 new product launches in America failed because of inadequate market seg­mentation (Christensen et al., 2005). Market segmentation is one of the most fun­damental concepts of marketing and is the key to successful business performance. It’s fairly obviously that there is no such thing as an average customer or consumer – it’s a bit like saying my head is in the oven and my feet are in the fridge, so on average I am quite comfortable. Let’s also get rid of the myths about market segmentation, such as the a priori nonsense about socioeconomics, demographics, geodemographics and the like. Socioeconomic classifications such as A, B, Cl, C2, D and E are useful generic descrip­tions, but in themselves they can only be useful at a very general level. For example, the Archbishop of Canterbury and Boy George are both “As” because of their spending power, but their behavior is almost certainly very different. Likewise, demographics such as young women between the ages of 18 and 24 can only ever be useful as a very high and general indication of patterns of behavior because it is clear that not all 18 to 24-year-olds behave the same. In a similar way, geodemographic classifications such as ACORN, (a classification of regional neighbor­hoods), while useful for indicating likely very general patterns of spending power, do not reveal the absurd assumption that everyone in one street drives the same car, reads the same newspapers, eats the same food and so on. Then there is the misguided school that clings to the outmoded and disproven notion of segmentation based on volume purchased. I did a catholic review of scholarly research into the history of market segmentation (Jenkins and McDonald, 1997). Due to editorial constraints, here is a brief summary of this and subsequent research. The father of market segmentation is widely con­sidered to be Wendell Smith (1956) who proposed market segmentation as an alternative to product differentiation. Yet it wasn’t until Wind’s (1978) review of the state of market segmentation that the topic went to the top of the agenda of researchers and practitioners. His plea was for new segmentation bases, data analysis techniques and for generally putting market segmentation at the heart of strategic decision-making. In 2009, a whole issue of the Journal of Marketing Management was devoted to market seg­mentation and for those readers wanting an updated literature review, see Bailey et al. (2009) in that issue. They confirm that most of the work over the intervening years has been primarily around what segmentation bases to use, such as size of purchase, customer characteristics, product attributes, benefits sought, service quality, buying behavior and, more recently, propensity to switch suppliers, with much of this work being biased towards fast-moving con­sumer goods rather than to business-to-business and services. Given the amount of academic scholarships and attempts at imple­mentation in the world of practice over the 60 years since Wendell Smith first raised consciousness of the importance of market seg­mentation, it is surprising that so little progress has been made. Yankelovich’s 2006 paper also reported the widespread failure of segmentation initiatives. This matches my own research over a 35-year period; an analysis of3,000 marketing plans revealed that only 300 contained proper needs-based segmentation – i.e. 90% didn’t. Having been Marketing Director of a major fast-moving consumer goods company, working on practical segmentation with senior teams from leading global multinationals down to SMEs for 40 years, I find much of the academic debate referred to above somewhat arrogant and inward-looking. I say this because anyone who says “we seg­ment markets by..:’ is totally missing the point. Any market, once correctly defined in terms of needs rather than products, consists of 100% of what is bought, how it is used and why it is bought and used in these ways. The supplier’s role is to understand these behavioral patterns and discover their ratio­nale, rather than try to impose some predetermined segmentation methodology onto the market. A propos the issue of whether new channels, new media, new technology and the subsequent changing behaviors has made traditional segmenta­tion obsolete, the answer is a resounding “No”. Fig. 5, shows some of the findings of a research club at Cranfield sponsored by IBM. It spells out the buying stages of consumers/customers and the different channels available to marketers. 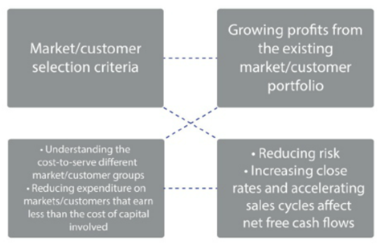 Figures 6 and 7 illustrate this buying process (please note it is dyadic, or interactive, rather than the outdated AIDA notion, which assumes that con­sumers react to inputs). 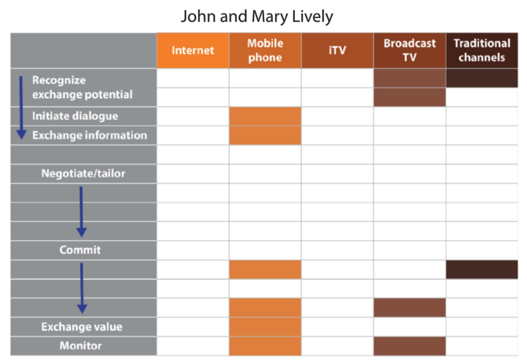 The figures represent the actual buying process of two out of ten segments for a global travel company. This interactive buying pro­cess is listed in the vertical left-hand column in the figures. On the horizontal axis with the shaded areas below are represented the segment’s actual behaviors. Although these have been disguised for confiden­tiality reasons, even a cursory glance would reveal that unless the real world behaviors of people in each segment were understood, any so-called “integrated communications” would be completely misdirected. This article is not aiming to spell out the cor­rect processes for carrying out proper needs-based segmentation, but rather to reinforce, for a new generation of marketers, the fact that rarely is any kind of marketing effective without it and that it has become even more important with the advent of new technology. For example, most so-called digital strategies are ineffective because the com­pany does not have a robust marketing strat­egy that spells out what the target markets are, how they are segmented and what the value proposition is for each key segment. Suffice it to say that any organization that embarks on any segmentation path other than needs-based segmentation is doomed to waste an awful lot of time and money. For readers who want a detailed explanation of the correct methodology for carrying out correct, needs-based segmentation, please refer to Market Segmentation: How to Do It; How to Profit from It by McDonald and Dunbar, Wiley 2012. 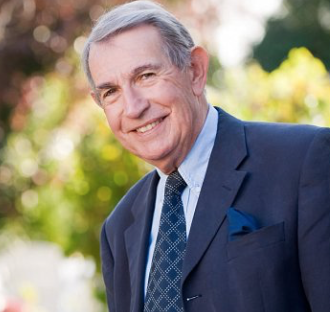 Malcolm McDonald is an Emeritus Professor at Cranfield University School of Management and an Honorary Professor at the Warwick Business School, England. He has written over 40 books, including the bestseller “Marketing Plans: How to Prepare Them, How to Use Them”. Bailey, C., Baines, P., Wilson, H. & Clark, M. (2009). Segmentation and Customer Insight in Contemporary Services Marketing Practice: Why Grouping Customers is No Longer Enough. Journal of Marketing Management, 25(3-4), 228-251. Christensen, C., Cook, S. & Hall, T. (2005). Marketing malpractice: the cause and the cure. Harvard Business Review, 83(12), 74-83. Coviello, N., Brodie, R., Danacher, P., & Johnston, W. (2002). How firms relate to their markets: an empirical examination of contemporary marketing practice. Journal of Marketing, 66(3), 33-46. Jenkins, M., & McDonald, M. (1997). 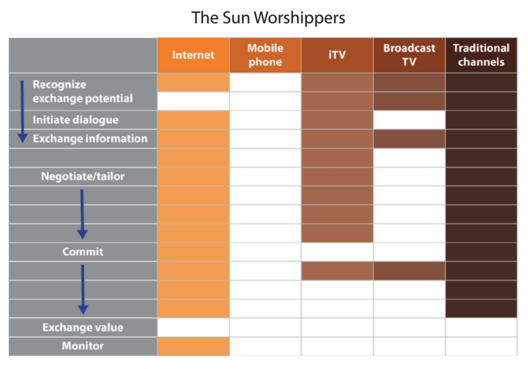 Market segmentation: organisational archetypes and a research agenda. European Journal of Marketing, 31(1), 17-30. McDonald, M., & Dunbar, I. (2012). 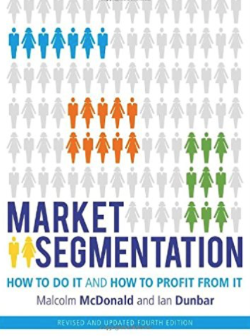 Market Segmentation: how to do it; how to profit from it, 3th ed. Oxford, UK: Butterworth-Heinemann. Rigby, D., Reicheld, F., & Scheffer, P. (2002). Avoid the four pitfalls of CRM. Harvard Business Review, 80(2), 101-109. Smith, W. (1956). Product differentiation and market segmentation as alternative marketing strategies. Journal of Marketing, 21(July), 3-8. Wilson, H., Daniel, E., &McDonald, M. (2002). 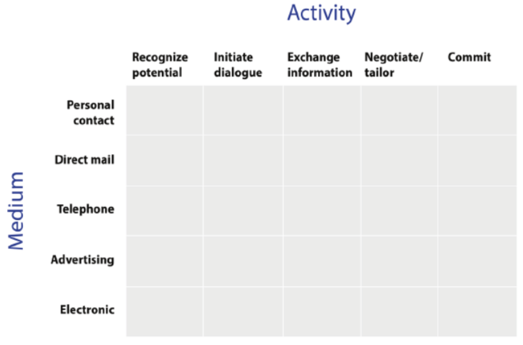 Factors for success in relationship marketing. Journal of Marketing Management, 18 (1-2), 199-218. Wind, Y. (19 78) Issues and advances in segmentation research. Journal of Marketing Research, 15, 317-337. Yankelovitch, D. (2006). Rediscovering market segmentation. Harvard Business Review, 84(6),122-131.